-- If games are with FEN, you can create a book to training these personal positions. -- It is possible to select more than one file, to remove by example. -- You can change the board size. Instalable : InsLucasChess61.exe ( http://www.mediafire.com/?7k16kd042qaee9n )- 16Mb. 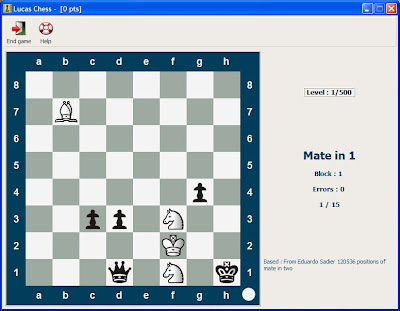 Portable : LucasChess61Port.exe ( http://www.mediafire.com/?95vgvyevnlq6frf )- 16Mb. This will create a new folder LucasChess. Run Lucas.exe from this folder. When moving from one version of Lucas to another in other folder, the way to keep one's personal data is to copy-paste the folder UsrData from the old installation to the new one, if the previous version is older than 4, copy the file lk35.pik lk37.pik or ... to root folder of lucas. New possibilities to configure boards. New tool, when playing in menu Utilities, Tree moves that is a system to document positions. * New training, Resistance test, other way to fight against engines. * Consult books Polyglot, changed view. * Direct option to maximize window. * Ctrl-mouse wheel : resize board. * New possibilities to configure boards. * New tool, when playing in menu Utilities, Tree moves that is a system to document positions. Instalable : InsLucasChess62.exe ( http://www.mediafire.com/?savfkw44fvasos1 )- 16Mb. Portable : LucasChess62Port.exe ( http://www.mediafire.com/?uvzzse4bhq2y6vo )- 16Mb. - New possibilities to configure boards. - Ctrl-mouse wheel : resize board. - Direct option to maximize window. * Mate in two from Eduardo Sadier, reduced from 120000 to 50000, but included information of origin of each position, and all moves are precomputed. Instalable : InsLucasChess62a.exe ( http://www.mediafire.com/?xbci995f9xx2q6b )- 16Mb. Portable : LucasChess62aPort.exe ( http://www.mediafire.com/?dbm31def5h0kadb )- 16Mb. * Scid position trainings are replaced by "Mate positions in GM games", and they include full games. * F11 key to full screen. * Menu option "Utilities" in "Trainings", now is Tools in base bar. - New training : Learning tactics by repetition. - Default theme : Cocoa Cream by Felicia. 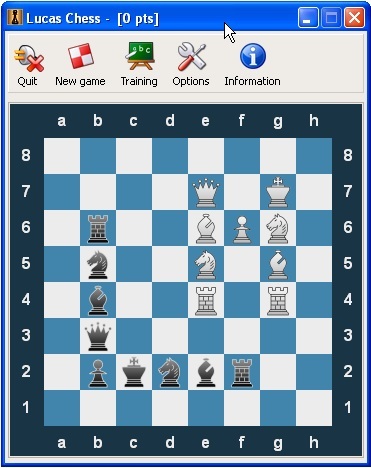 - Scid position trainings are replaced by "Mate positions in GM games", and they include full games. - F11 key to full screen. - Menu option "Utilities" in "Trainings", now is Tools in base bar. * Determine your calculating power. * Moves between two positions. * Becoming a knight tamer: tests to know/improve your skills with a knight. New training : Learning tactics by repetition. Default theme : Cocoa Cream by Felicia. Scid position trainings are replaced by "Mate positions in GM games", and they include full games. F11 key to full screen. Menu option "Utilities" in "Trainings", now is Tools in base bar. There is now an update, 6.3a than can be installed from Information option, Check for updates. It solves two little bugs, that probably go unnoticed. Thanks for the new version Lucas. Keep up the good work. "The update will be possible in the same way (Information-Check for updates)"
Lucas Chess GUI is really good!!!! Improving my game by using this...thanks Steve.R"
- LC can be associated extension PGN. - When editing variations, added options, "Plays instead of me" (Utilities) and "Enable engine" (Config) (bolokay). - Many internal changes, main is the use of the library Pyro4, which uses an arbitrary tcpip port for communication between processes (now between sounds manager and main program), so that the firewall may complain.